Liverpool's Mohamed Salah will face no action from the Football Association over the incident which led to his penalty against Newcastle at Anfield. The Egypt forward, 26, went down after minimal contact from Magpies defender Paul Dummett. 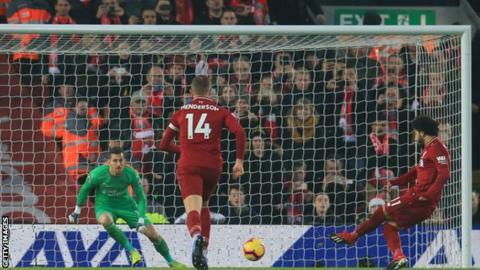 Salah converted from the spot in a 4-0 win, a result which put the Premier League leaders six points clear. As there was contact between the players, it did not meet the FA's threshold for a disciplinary charge. Salah could have faced a two-match ban, which would have seen him miss key league games against Arsenal and Manchester City.